Here are the top closing pitchers in Box-Toppers points (BTP) over the past season (2017), the past two seasons (2016-17), the past six seasons (2012-17) and “all-time”—the past 23 seasons (since 1995, when Box-Toppers tracking began). For the most recent seasons, the top five closing pitchers in each league are shown. For the “all-time” rankings, the top five overall closing pitchers (including retired players) are shown at left and the top five active closing pitchers in career Box-Toppers points are shown at right. Some players played more than one position, but even if their primary position was not closing pitcher, they are listed here. Trevor Hoffman has the most Box-Toppers points of any closing pitcher since tracking began in 1995, more even than Mariano Rivera, considered by many to be the greatest closer of all time. Hoffman has 129.4 career Box-Toppers points, edging out Rivera—with 126.4—by only 3.0 points. But Hoffman would have even more Box-Toppers points if his entire career from 1993 were tracked. Rough projections put his career total at about 135 Box-Toppers points, which would pad his lead over Rivera, who began his career in 1995, the same year Box-Toppers tracking began. Meanwhile, Craig Kimbrel of the Red Sox leads active closing pitchers in career Box-Toppers points. He also has the most points of any closing pitcher over the past two seasons and past six seasons. And Edwin Diaz of the Mariners led closers in Box-Toppers points in 2017. The chart above shows the top five closing pitchers over several time frames—over the past season (2017), the past two seasons (2016-17), the past six seasons (2012-17) and “all-time”—the past 23 seasons (since 1995, when Box-Toppers tracking began). For the most recent seasons, the top five closers in each league are shown. For the “all-time” rankings, the top five overall closers (including retired players) are shown at left and the top five active closers in career Box-Toppers points are shown at right. Here is a season-by-season breakdown of Box-Toppers points (BTP) earned by Trevor Hoffman and Mariano Rivera over their careers. Also shown are the number of saves each player earned each season. Rivera was primarily a starter his first two seasons so has fewer saves in 1995 and 1996. Hoffman began his career in 1993, prior to Box-Toppers tracking. Had those seasons been tracked, rough projections put his career total at about 135 Box-Toppers points. * Total does not include all of Hoffman’s 601 career saves—he had 25 more saves in 1993 and 1994. (He had five saves in 1993 with the Marlins and Padres and 20 saves in 1994 with the Padres.) Hoffman’s 601 career saves is second all-time behind Rivera’s 652. Hoffman, who played from 1993 to 2010 primarily for the Padres, but also for the Brewers and Marlins, ranks second in all-time saves with 601, behind Rivera’s 652. Rivera, who played from 1995 to 2013 with the Yankees, cemented his status as baseball’s greatest closer not just by holding the all-time saves record, but also for being a key member of a Yankees team that won five World Series championships, including being World Series Most Valuable Player in 1999. Still, Hoffman has more Box-Toppers points than Rivera. Why? One reason is that Rivera played for better teams than Hoffman. His Yankees teammates included all-time Box-Toppers points leaders and Rivera had to compete against those players to earn Box-Toppers Player of the Game honors. Rivera’s teammate, Derek Jeter, considered to be the superior shortstop of the past quarter century, similarly ranks second among shortstops in career Box-Toppers points since 1995. For both Rivera and Jeter, there simply weren’t enough Box-Toppers points to go around and both players’ career point totals were likely diminished. CC Sabathia, 192.7 points, ranked fifth. Alex Rodriguez, 187.0 career Box-Toppers points, ranked seventh among all players. Roger Clemens, 164.8 points, ranked 13th. Mike Mussina, 155.6 points, ranked 17th. Andy Pettitte, 138.5 points, ranked 30th. Jason Giambi, 133.4 points, ranked 31st. Rivera, considered to be a lock to be a first-ballot Hall-of-Famer when he becomes eligible for voting in 2019, ranks 38th among all players in career Box-Toppers points. Hoffman, who was voted to the Hall of Fame in January in his third year of eligibility, ranks 32nd among all players in Box-Toppers points. 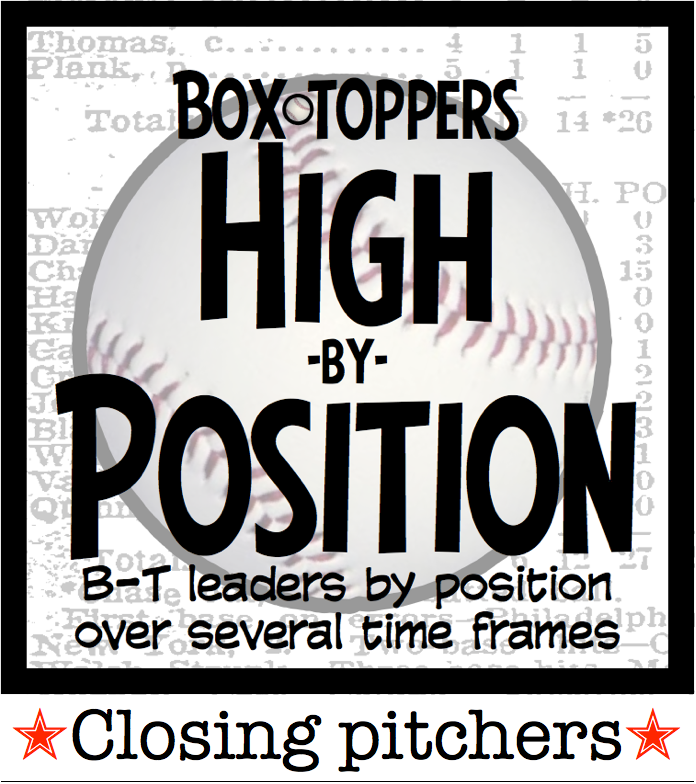 In general, closing pitchers have fewer Box-Toppers points than starting pitchers. There are 22 starting pitchers who have more career Box-Toppers points than Hoffman. There are only three closing pitchers among the top 100 players in Box-Toppers points since 1995 (Hoffman, Rivera and Billy Wagner), while there are 57 starting pitchers. But starting pitchers pitch more innings and strike out more players, which can result in higher Box-Toppers game scores that are used to determine Player of the Game honors. Plus, starting pitchers appear in every game and closers, who are often only utilized in special situations (such as having a narrow lead late in the game) do not. Even when they are used, closers generally pitch only an inning, lowering their chances of a high Box-Toppers game score. And closers generally only earn Box-Toppers points when earning a save in a low-scoring game while striking out multiple batters. Of the five players leading closers in Box-Toppers points since 1995, only Hoffman played before the advent of Box-Toppers. The other four, all retired, began their career in 1995 or later (Rivera, Wagner, Troy Percival and Brett Myers). In 2017, Kimbrel of the Red Sox rose to lead active closing pitchers in career Box-Toppers points with 67.4, passing previous leader Francisco Rodriguez (63.4). Rodriguez was signed and released by both the Tigers and the Nationals in 2017 and earned no Box-Toppers points during the season. Kimbrel also leads closing pitchers in Box-Toppers points over the past six seasons (61.4 from 2012-17) and over the past two seasons (16.7 over 2016-17). He ranks second among American League closers over the past season (8.7 in 2017). Kimbrel ranks sixth among all closers in career points since 1995, when Box-Toppers tracking began—his 67.4 Box-Toppers points is 4.8 points behind fifth-ranked Brett Myers. Also, Kimbrel is the only closing pitcher to appear among any of Box-Toppers top 10 pitchers (including starters) for any time period at the end of the 2017 season. Kimbrel is the eighth-ranked AL pitcher over the past six seasons (61.4 Box-Toppers points from 2012-17). Diaz of the Mariners leads closing pitchers in Box-Toppers points over the past season (9.0 in 2017). He also ranks second among AL closers over the past two seasons (16.0 over 2016-17). Holland of the Rockies led NL closers over the past season (8.0 Box-Toppers points in 2017). He also ranks second among NL closers over the past six seasons (38.0 from 2012-17). Jansen of the Dodgers leads NL closers in Box-Toppers points over the past two seasons (13.0 over 2016-17) and past six seasons (38.7 from 2012-17). He also ranks second among NL closers over the past season (7.0 in 2017). Of the top five active closing pitchers in career Box-Toppers points, four played in 2017, but only two earned Box-Toppers points during the season. Third-ranked Jonathan Papelbon, 37, was listed as a free agent and remained unsigned through the 2017 season and apparently has not officially announced his retirement. Papelbon, who has 54.4 career Box-Toppers points, last pitched in 2016 for the Nationals. Two other among the top five active closers in career Box-Toppers points played in 2017, but did not earn any Box-Toppers points during the season—Francisco Rodriguez, who played for the Tigers and was also signed by the Nationals in 2017 and Huston Street, who played for the Angels. Rodriguez ranks second among active closers with 63.4 career Box-Toppers points and Street ranks fifth with 51.0. Kimbrel, the active career points leader among closers, as previously mentioned, had 8.7 Box-Toppers points in 2017. Fourth-ranked Bud Norris of the Angels had 6.0 Box-Toppers points in 2017. While Norris qualified as a closing pitcher in 2017, earning Box-Toppers Player of the Game honors six times during the season, all as a closer, he has primarily been a starter throughout his career, earning all of his other 46.1 career Box-Toppers points from 2009 to 2016 as a starting pitcher.